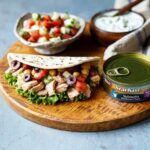 These Mediterranean Tuna Mini Pita Wraps were created in partnership with StarKist. As always, all opinions and recipe are my own. Thanks for supporting the brands that support Shared Appetite! It’s officially the start to the holiday season. And as much as I try my best to avoid thinking about Christmas until after we fully celebrate Thanksgiving, I know as soon as I step foot into any store within the next week… BOOM. Christmas everywhere. The holiday season is definitely a magical time. I’m so excited that Olivia is now old enough to begin understanding what Thanksgiving and Christmas is (side note: I can’t wait to decorate the house with her… she’s going to LOVE it), and I try my hardest to fill our home with family and friends every chance I get over the next two months. This is PRIME ENTERTAINING SEASON, people! With a lot of our friends now having kids of their own, night time adult-only soirees have been replaced with lunchtime playdates. Menu planning has been replaced with holy crap this place looks like a disaster and we have people coming over in a few hours. Preparing something delicious for friends to eat is still one of my top priorities, but the time I have to prep is way less. Is anyone else obsessed with Mediterranean flavors? The flavors are so bold, clean, and bright… it’s healthy without feeling healthy (that’s the best kind, isn’t it?!). 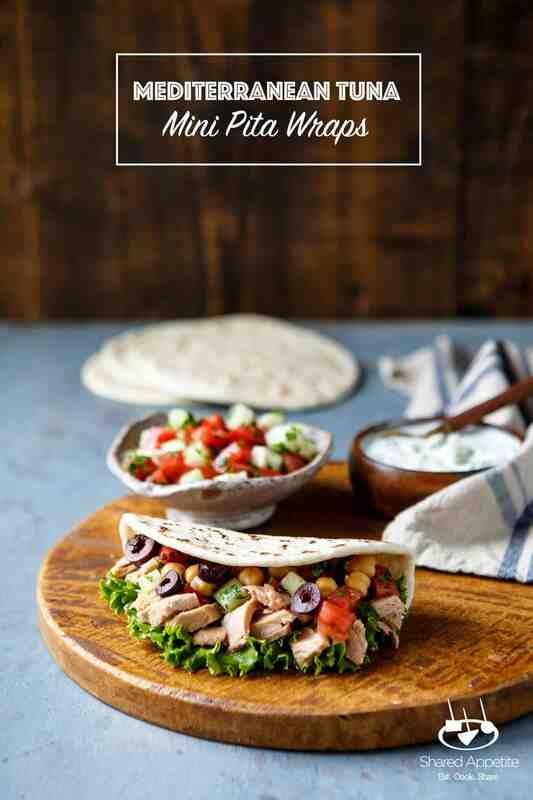 These Mini Mediterranean Tuna Pita Wraps. They pack a powerful flavor punch and can be easily made at the moment by guests when they’re hungry (with all the components very quickly prepped by you before anyone arrives). It’s the perfect easy entertaining lunch recipe! One of my favorite lunch time get togethers we try to make happen each year is some sort of friendly cookie swap. We do it after church on a Sunday, so it involves a house full of families with small children. It’s… chaotic. With all the business of organizing the massive amounts of cookies and having the house literally full with people, my menu is simple. Put out a bunch of different DIY sandwich ideas and… let guests help themselves. This is KEY to stress-free entertaining. You do the prep work beforehand (i.e. make any salads and spreads), and then let everyone make their own concoctions. 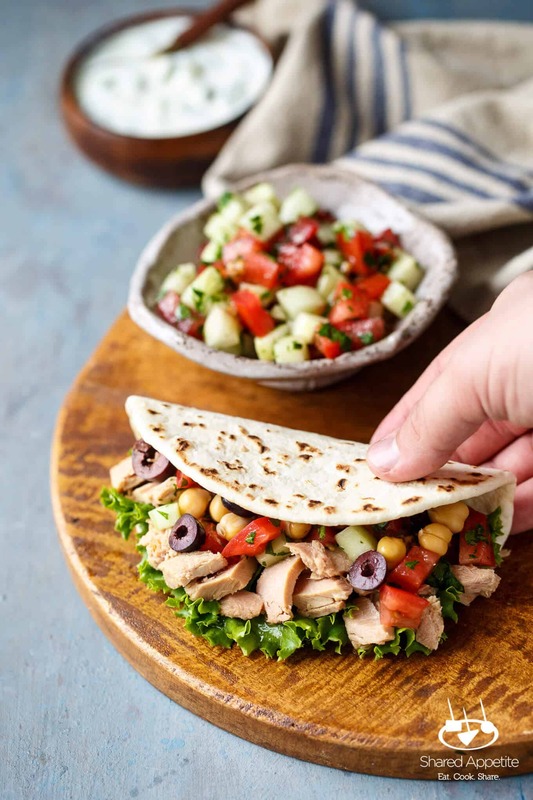 These Mini Mediterranean Tuna Pita Wraps are going to be perfect for the holiday lunch sandwich spread. 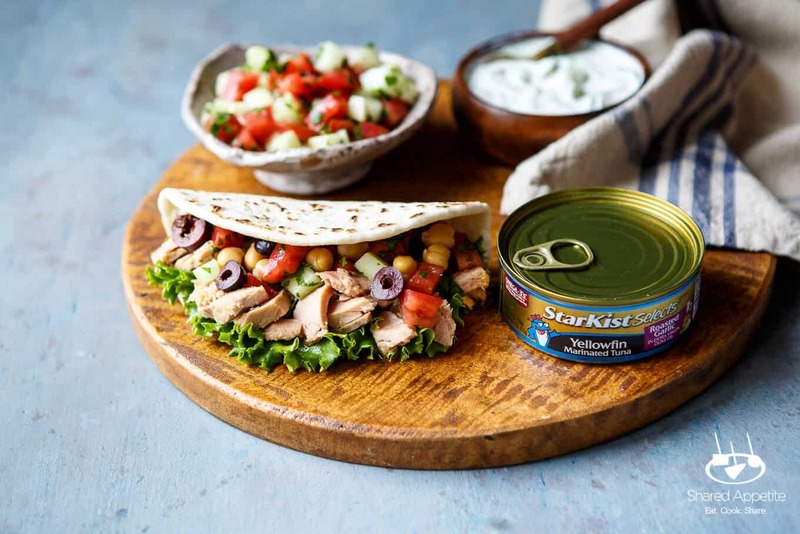 Grab some mini pitas and StarKist Selects EVOO canned tuna. Whip together a quick tzatziki and Israeli salad. Put out some other sandwich accompaniments. Boom. Instant success with minimal effort. It’s my favorite type of entertaining… easy elegant! Whenever I bought canned tuna in the past, I was usually a tuna in water kinda guy. It’s simply because that’s what my mom always bought when I was a kid. 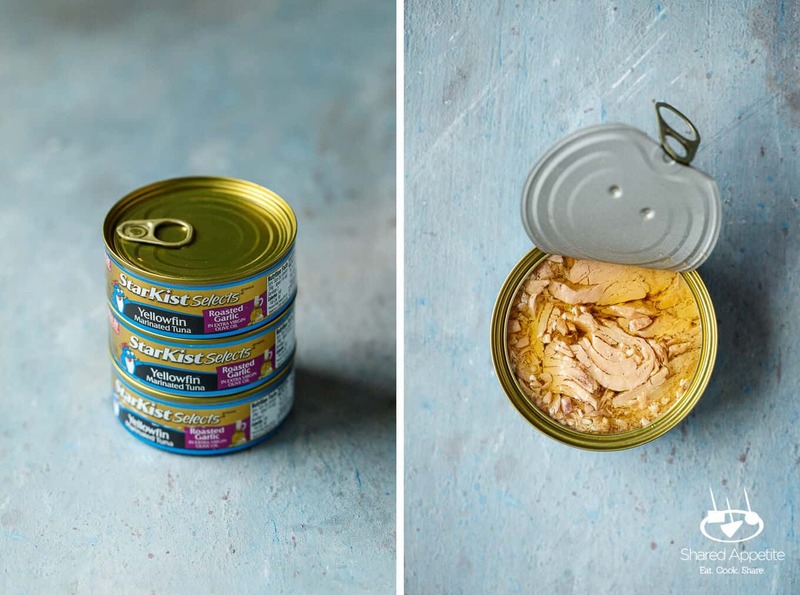 When I found that eye-catching can of StarKist Selects EVOO Roasted Garlic YellowFin Marinated Tuna staring back at me at my local grocery store, I was intrigued. I mean, I already love EVOO, and this YellowFin tuna (hello, super high quality!) is packed in cold-pressed, Tunisian extra virgin olive oil! Whenever I look at a label on a package, the fewer the ingredients the better. That’s why I love that these StarKist Selects EVOO contain simple, clean ingredients. Tuna. EVOO. Salt. That’s what I’m talking about. But probably most impressive about this StarKist Selects EVOO? The taste. The tuna was tender and luscious that’s to being packed in extra virgin olive oil! It was so good! And I love that even if I’m on the go and can’t deal with the whole canned tuna thing, there’s a pouch packaging option! Perfect for bringing your StarKist Selects EVOO to work! Check their store locator so you can find all of the StarKist Selects EVOO products near you! StarKist Selects EVOO comes in a few different flavors. My local grocery store had the Roasted Garlic variety and I was super pumped with how it gave these Mini Mediterranean Tuna Pita Wraps even more flavor! It went so well with the fresh and bright flavors of the Israeli Salad and creamy and acidic tzatziki. I can’t wait to add these to my regular lunch rotation. Healthy… easy… and SO freaking delicious. I know they are going to be SUPER popular for all my holiday lunch entertaining as well! 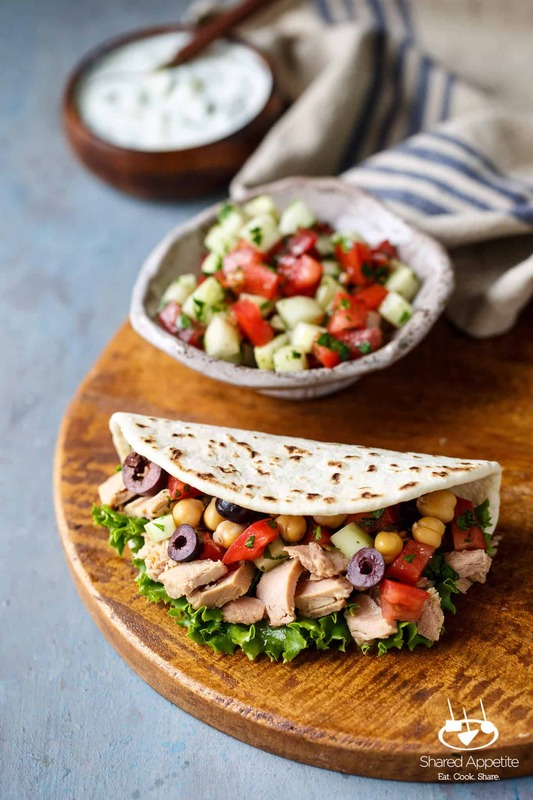 Mini Mediterranean Tuna Pita Wraps for the win! 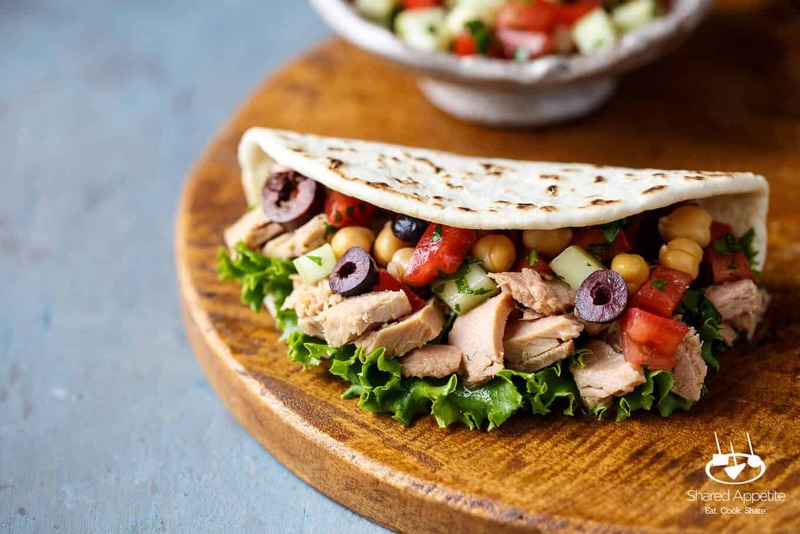 Place tuna, Israeli salad, tzatziki, chickpeas, olives, and lettuce on pita. Fold and devour. Using the smaller side of a box grater, grate cucumber. Soak up excess cucumber moisture with paper towels. In a small mixing bowl, combine Greek yogurt, 3 tablespoons of the grated cucumber, two tablespoons lemon juice, garlic, mint, and dried oregano. Season with Kosher salt. Taste and adjust seasonings (add more lemon juice, etc.) as desired.